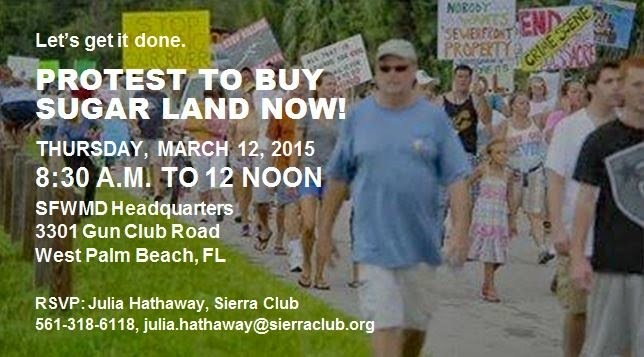 Sierra Club Florida News: BUY SUGAR LAND NOW PROTEST - Be there March 12! BUY SUGAR LAND NOW PROTEST - Be there March 12! Governor Rick Scott and his appointed water managers are refusing to buy sugar land needed to restore the Everglades, protect the coasts, and preserve our drinking water and time is running out! We will protest outside the South Florida Water Management District meeting to demand the state's purchase of 48,600 acres of US Sugar land. Let's make them change their minds! We WILL make a difference together! Can't spend the whole morning with us? Come as early and stay for as long as you can. Click here to read a Palm Beach Post editorial that explains the urgency for action.